On the Britt side of my family, I had the Confederates. On the Dickinson side, I had the Union Soldiers. John W. Dickinson was born at Oyster Bay, NY in 1843. John W. married Emma Woodruff, who was born in Elizabeth, Union County, New Jersey in about 1847. 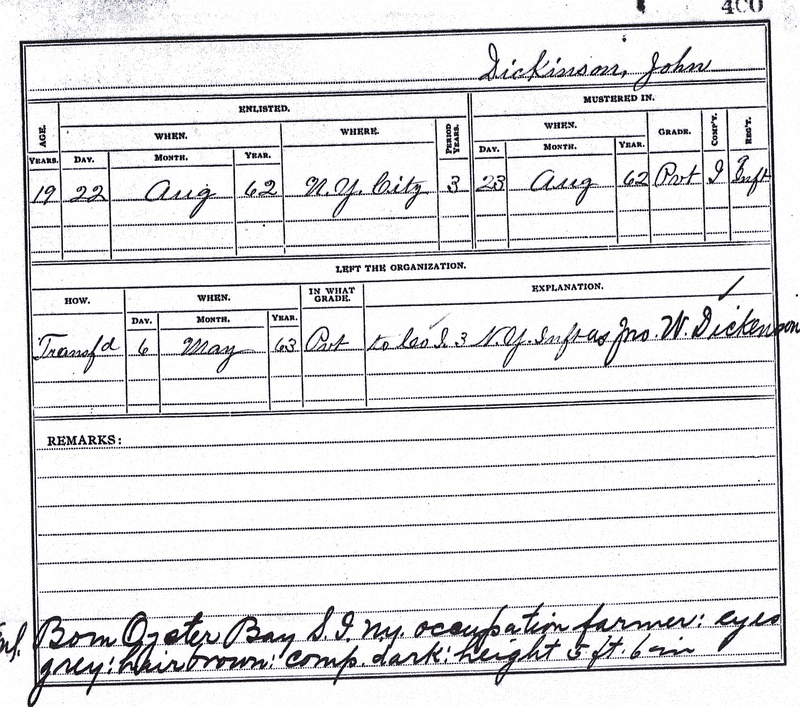 He enlisted in the war originally on May 6, 1861 and then reenlisted on August 22, 1862. 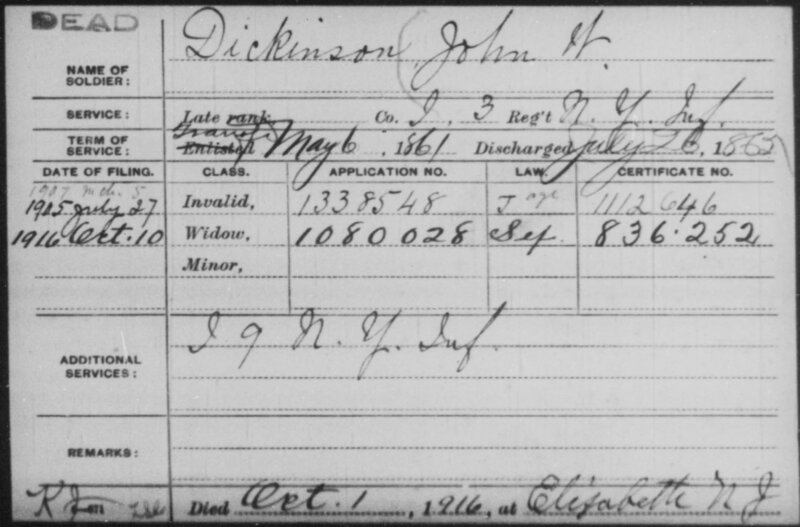 From September 28 of 1864 until June 19, 1865 (when he mustered out) he was in the hospital. Part of the time he was in Ward U.S.A. General Hospital, Newark, NJ. The records don’t say if he was injured or sick — many of the men caught communicable diseases like typhoid, Camp Fever, dysentery or tuberculosis. 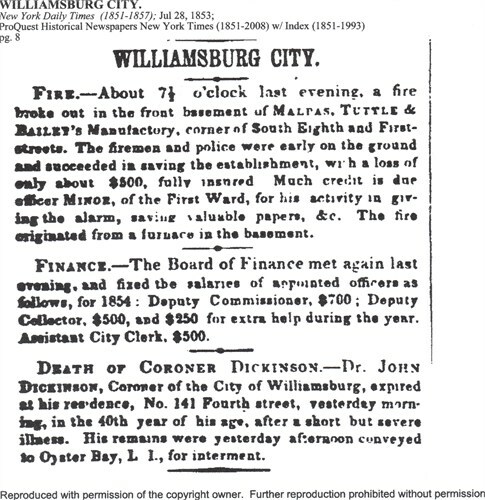 John H. Dickinson was the Coroner of the City of Williamsburg, NY. It is such a coincidence that my daughter and her family live in Williamsburg, which is now part of Brooklyn, NY. We’ve gone a full cycle back to our genealogical roots. Unfortunately for John H., he died in his 40th year of age. John H. Dickinson married Mary Weeks. They had seven children and all died in infancy or unmarried except two, Anne, Born 1839 who married H.M. Funston, and John W. Dickinson who married Emma Woodruff and had four children. 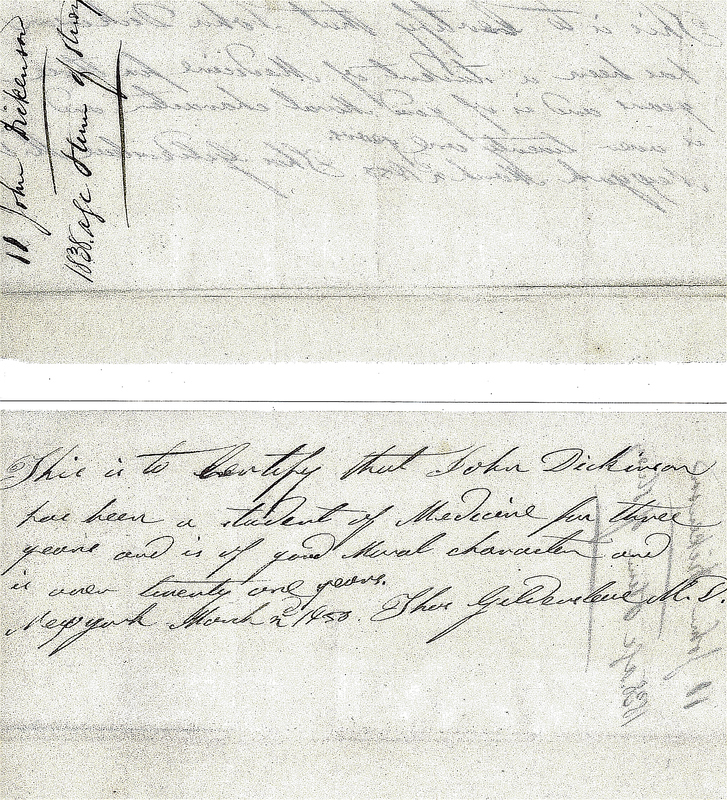 I am here because of John W. Dickinson — but more about him later. Below is John H. Dickinson’s Obituary. They took his body back to Oyster Bay, NY on some kind of wagon with horses. I imagine he wasn’t in the best shape upon arrival.